We’ve all been there: whether it’s with a roommate who keeps leaving out dirty dishes, a friend who borrows money without paying us back, or a significant other who isn’t pulling their domestic weight, at some point, we’ve all had to communicate with someone about an uncomfortable subject. These topics can be difficult to navigate, but it’s essential that we learn how to discuss them in a healthy manner because communication difficulties can have serious consequences. A 2013 study found communication issues to be the number one cause of divorce, according to a survey of mental health professionals. In the workplace, experts estimate that employers in the US and UK lose $37 billion per year as a result of poor communication. 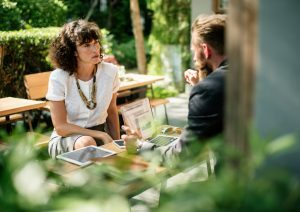 While there are many facets of communication at play in both these scenarios, the challenge of handling tough conversations is key. For example, we can probably think of times when we didn’t want to offend someone by pointing out a disruptive behavior of theirs…so we kept quiet and developed resentment towards them. Or perhaps a coworker had inefficient work habits, but we felt guilty critiquing them and never brought those habits up, thereby preventing them from making positive and productive changes. Our hesitancy to engage in tough conversations is understandable. Those talks are difficult enough to have because of their subject matter—and they can be made even more challenging by common communication issues like stress, cultural or linguistic differences, a failure to understand the other person’s point of view, or difficulty concentrating. Feeling ill might make you less able to articulate your thoughts or pay attention to another person’s words. A personal trauma history might make certain subjects triggering for you. 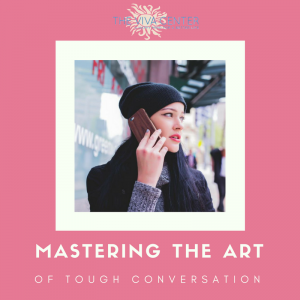 There’s no way to guarantee that we can get through tough conversations without any stress or hurt feelings, but there are actions we can take to set up and pursue these conversations in a healthy manner. Here are a few examples. It can be tempting to bring an issue up immediately upon noticing it, but Dr. Robert Leahy recommends putting consideration into when we start our discussions. Waiting until we’ve had time to calm down and organize our thoughts can help us articulate ourselves better, and it might also prevent us from saying anything we’ll later regret. Additionally, letting things cool down allows us to wait for a time that is more conducive to discussion. Instead of bringing up an discussion when one or both parties are overwhelmed by stress, fatigue, or any other emotion that makes it difficult to pay attention and/or empathize, we can pick a moment when we feel calm enough to talk, alert enough to listen, and unrushed by other responsibilities. Dr. Leahy also recommends “editing” what we’d like to say—in other words, rehearsing how to courteously and succinctly express our feelings so that the other person is more likely to understand us. Dr. Leahy recommends making sure your sentences are short and clear to make your communication more efficient. Researchers at Iowa State University advise making an effort to understand the other person’s perspective. 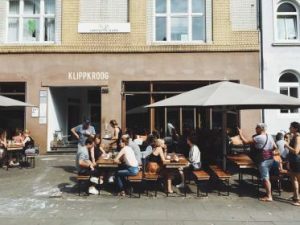 Seeing the issue through their lens may be a helpful way to develop a solution; for example, if you learn that your roommate doesn’t clean the dishes because she’s feeling really sleep-deprived and doesn’t have the energy, you might offer to keep your music down late at night to help her get the rest she needs. Try to keep the tone friendly and avoid playing the blame game, as your conversation partner will be less inclined to listen if they feel like they’re on the defensive. Dr. Leahy recommends “making suggestions for change (“It would be helpful if you cleaned up a little before dinner”), while giving credit for some positives (“I do appreciate your help with the shopping”)” as a way to encourage your conversation partner’s participation and to signal to them that you’re having a discussion, not launching an attack. The Iowa State University researchers emphasize that “you can listen to each other and still have differences.” Respecting another person’s opinion doesn’t necessarily mean giving up your own. Likewise, your communication partners are capable of listening courteously even when they disagree with you. If they are being disrespectful or rude, that’s a choice they’ve made. Treatment strategies may include opening lines of communication, bringing awareness to how our unconscious thoughts affect our interactions, and teaching new relational skills. It’s not just family members or couples who can benefit from relational therapy—friends and coworkers can also benefit from mediated problem-solving sessions. For example, Karen Kilgariff and Georgia Hardstark, co-hosts of the hit podcast “My Favorite Murder,” have been open about seeking therapy to support both the professional and the personal aspects of their relationship. What topics are the most challenging for you to discuss? Which communication methods have been most helpful for you? Send your feedback to lilly@vivapartnership.com, and feel free to contact any of our therapists with your relationship and/or communication questions via their individual emails (see their specific pages for more info) or info@vivapartnership.com.